Thanks to the Recycled Rides program, a very deserving veteran in San Jose recently received the life-changing gift of a donated car. Jaime Duran is a 14-year veteran of the U.S. Army Reserves and a single mother. Several years ago, she gave up her job, car, and home to move with her son and new husband to the United Arab Emirates for his contract job. After a short time, the relationship turned abusive both physically and mentally. Jaime and her son returned to San Jose where they live with friends. Jaime is attending college classes and working temporary jobs to supplement her income and continue on the path to financial recovery. 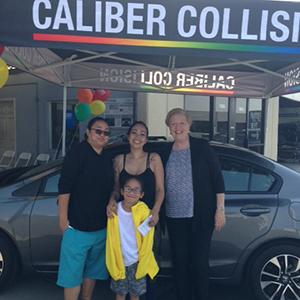 The car, a newly refurbished 2013 Honda Civic, was donated by Allstate and repaired by technicians at Caliber Collision in Willow Glen who volunteered their services to repair the vehicle as a community service. Earlier this month, Jaime received the keys to her Recycled Ride at an event in San Jose- view all of the photos here.